How can we teach the next generation to "build with biology"? Much of recent progress in biomedical engineering, especially in the field of tissue engineering and regenerative medicine, has been enabled by advances in biofabrication. The manufacturing tools that have been adapted for use with biological materials, such as 3D printing, have given the biological “maker” community an invaluable resource with which to design biological and bio-hybrid systems. Since biological materials respond and adapt to their environments in ways that synthetic materials traditionally do not, learning the design rules for building with such materials is not a trivial matter of applying principles developed for synthetic materials. As a result, teaching these design rules is also not a trivial matter, and must be investigated more thoroughly to develop best practices for biofabrication in the classroom. While the positive effect of lab-based experiential learning and project-based learning (PBL) approaches have been previously studied in the context of biomedical engineering, there is a dearth of studies looking specifically at biofabrication. This is important because biomedical engineering, as a field, is too diverse and interdisciplinary to be governed by a single set of instructional practices. Moreover, biofabrication is a fundamental technique for a variety of end-use applications, and a strong grounding in these fundamentals is essential training for the next generation of biological makers. Recently, I helped design and implement an upperclassman-level undergraduate class focused on biofabrication at the University of Illinois at Urbana-Champaign. In the first year of implementation, the class was evaluated by educational researchers and proven to be an effective method of teaching students to uncover and apply the principles of biofabrication. The class doubled in enrollment in its second year, and will be taught for a third year this fall. Portions of this class have also been successfully implemented at the University of California, Merced. The fundamentals of using previously developed tools and techniques should be taught via robust and optimized protocols. The first four labs of our class taught the basics of 3D bio-printing, 2D and 3D cell culture on and in hydrogels, injection molding, and gene transfection. For these labs, we used protocols and reagents that had been tested and optimized on-site. The resultant increased success rate for replicating well-characterized experiments helps maximize student confidence in and understanding of the underlying principles governing these techniques. Imaging techniques and assays for evaluating the performance of biological tools should be integrated into every lab. Evaluation is a critical part of any scientific experiment. Teaching students to ask “what am I measuring?” followed by “what can I use to measure this?” at the start of each experiment helps build a toolkit of assays and imaging methodologies that are broadly applicable to future experiments they will conduct. The final project should be ill-structured and open-ended – like the real-world! The capstone design project for our class was to work in teams to design and build a bio-hybrid device or machine to target any engineering challenge. This open-ended challenge was followed by a series of brain-storming sessions where students got critical feedback on project impact and feasibility from the instructors. Students designed, executed, evaluated, and presented their own experiments, cementing their understanding of the scientific method with specific focus and depth in the field of biofabrication. Furthermore, the ability to choose their own projects proved so exciting to the students that, after the first run of the class, 50% of enrolled students continued to work on their projects the next semester. Biofabrication provides great opportunities and promises to have tremendous impact on our world. Training the next generation of engineers, scientists, and “makers” to responsibly and effectively “build with biology” will be the key factor that determines the future success and significance of this field. Thank you to Elizabeth Innes for taking the photo used in the poster image. Raman, R., Mitchell, M., Perez-Pinera, P., Bashir, R., and Destefano, L., 2016.Design and Integration of a Problem-Based Biofabrication Course into an Undergraduate Biomedical Engineering Curriculum. Journal of Biological Engineering, 10(1), pp.10-18. 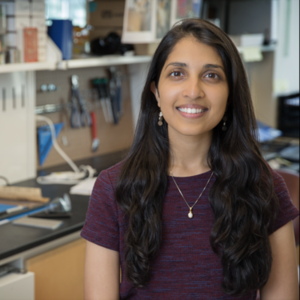 Ritu, thanks much for sharing your experience in the design and implementation of a practical course in biofabrication. I am curious about the open-ended capstone projects. How much coaching did the teams need at this stage? I guess it was important to make sure that the proposed projects were reasonably challenging (and technically feasible, of course) yet not daunting? Any specific examples that you can share? Thanks for this question! The fourth lab, prior to the final project, was to 3D print a skeletal muscle-powered robot (bio-bot) that could walk. The students often use this project as a jumping-off point for the final capstone project - for example, one student group decided to build a muscle-powered peristaltic pump that could be used as replacement tissue for damaged/diseased esophagus in vivo. Students thrive under regular coaching, but not over-coaching. We made sure to give them plenty of time to discuss and brainstorm by themselves, but made ourselves available through weekly "office hours" and email to discuss impact and feasibility. Since the end goal of the project was to design and execute an experiment, not build a fully functional product, the surveyed students seemed to find the experience more enjoyable than daunting. Hope this answered your questions! Thanks! It indeed makes sense that the emphasis is on design and execution rather than the final product.